We just learned of something that will immediately goes into the “why didn’t we think of that sooner” file: a free-to-the-public film series with the Hudson as the backdrop. It happens at Washington’s Headquarters, Liberty Street, Newburgh, N.Y. every last Saturday of the month in the warmer months. “The movie night was something that happened organically,” explains one of the organizers of the Liberty Street Film Series, Mike Kelly, owner of The Liberty Street Bistro. “I was sitting with my friend, Pat Nunnari, and we started thinking about something to help generate awareness about Newburgh, and then we were talking to friend Ted Doering. He said, “if you ever have an idea for that vacant parking lot property in front of the foundry, let me know! “I then started talking to Paul Ernenwein who is very active in Newburgh, and we said ‘let’s figure out how to play a movie (to the public)’ and that got a lot more people involved. The group approached Elyse Goldberg Director of Washington’s Headquarters in Newburgh, in order to inquire about using the Headquarters as the locale, and she also became part of the group. Kelly’s bistro became the meeting place for the group over the next few months, where the group sorted out permits, advertising needs, sponsorships, with Giancarlo contacting Dawn Ansbro of the Orange County Arts Council . The Orange County Arts Council became the 501c-3 through which the series was set up, for organizational purposes. The Liberty Street Bistro donated a high quality, inflatable screen (available to rent by contacting the Bistro). Giancarlo Lorusso worked out the details for sound equipment, and a projector was obtained from the Public Art Project, in Flint Michigan. 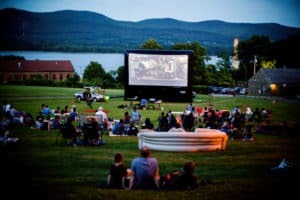 Mike Kelly summed up the group effort as being led by a desire to be part of the revitalization of Newburgh, with the idea that a summer night on the Hudson watching a movie under the stars might be a nice place to start. July’s movie is set, and the selection is the Americana classic, Casablanca. Bring popcorn, pillows, and a comfy chair or a blanket, and we’ll see you there!